Greetings in the Name of the Lord, my friends. I bring blessings to all of you. Only a person on the road of spiritual development can truly love God. How then can we explain that “all things work together for the good”? And this is, indeed, the truth, my friends! For the person who follows the path of development and purification, whatever happens must be for the good! Only when you have reached a certain stage of development will you come to realize the truth of these words. There is no apparent tragedy, mishap, or misfortune that does not carry some good for one who follows this path and thus proves his or her love for God. Yet so many of you do not know this. You are still living under the delusion that this is a world of coincidence and chance, or even a world of injustice. Though you may not think this is true, many of you feel so. And that is your great error and your tragic illusion. On the other hand, a person who is not following this path, in other words a person who does not love God above everything, will find that the best things happening to him or her will not be for the good; later on these supposedly best things might create difficulties and tests that might only begin to work for the good in future incarnations at the moment this path has been started. Up to that time in a person’s development nothing is for the ultimate good. However, from that time on, which is the crucial period in a soul’s evolution, everything that happens, has happened and will happen, must be for the good. And for those of my friends who are following the lectures and study with me on this path of self-purification, it may be an excellent exercise and meditation to think of all the tragedies, difficulties, and troubles of your life up to now—past and present. If you can find some good in them, you will have taken a further step upward. As long as these words remain just words for you, they are not sufficient. You must come to the point where you deeply realize their truth. If understanding is still lacking and you cannot find the good in a particular situation or happening, it must indicate that some important piece of self-knowledge is still missing. For if it were not lacking, you could immediately find how each misfortune will touch off a particular fault or reveal ignorance of an emotional current running contrary to Divine Law. If you do know all your inner weak points, you will come to understand that without such apparently disadvantageous happenings, these weaknesses could not enter your conscious mind. You could not truly understand them—which is the basic requirement for transformation. But where you cannot make the connection, you may come to me to ask more precise questions, and I will guide you to find the connecting point in your own soul. Remember, my friends, once you are on this path, even your wrong actions and faulty judgments become beneficial to you—will become more than just meaningless happenings coming from the outside! You all know that to love your fellow-creatures is one of the most important laws of the universe. We have discussed love at great length: how to acquire it, what stands in its way, how to face your inability to love as you would like to, etc. However, now I should like to address a few of my friends who are already capable of love to some degree. It is only a question of degree. As long as you are not completely purified, your love cannot be divine and perfect. Your love will be blurred to the extent you are still lacking purification. The deviation from divine love may take place in various ways, according to the complexities of an individual’s character. One way is putting the loved one on too high a place. In other words, you invest the loved one with a perfection he or she does not possess as yet. And here you are doing a great wrong, even though you may feel that this is really a proof of your love. This is not true. It must be a burden to the loved one to be overestimated. Sometimes consciously, though more often unconsciously, the loved subject will sense it and will therefore feel a compulsion to live up to the idealized image. All human beings are starved for love; most seek it in the wrong way, namely to receive it first and give it perhaps afterwards, provided there is no risk involved. This longing for love forces the subject to struggle to maintain the idealized image, fearing that if they fail to do so, the love may be jeopardized. At the same time, the subject resents the giver of love, because deep down they feel that this kind of love is wrong. The unpurified soul lacks the strength to risk losing the love given on false premises. So the person feels compelled to create a mask self in which, of course, they never really feel comfortable, at ease, and loved for their own sake and for their real personality. So I should like you to search within yourselves, my friends: Do you silently, or even thoughtlessly, demand too much perfection from someone dear to you? When you find the affirmative answer, you will know that this is not a good and healthy love, neither beneficial to you nor to the loved subject. It is to some measure in your power to help destroy the harmful masks of others. This you can do not only by destroying your own and courageously facing up to your real self, but also by trying to see and love the other as he or she really is and not just as an idealized picture. Furthermore, realize your deeper and hidden reasons for needing a more perfect love subject than reality produces. In all probability there is a measure of pride in you which you cover up with the type of love you are bestowing. In addition, there must be a lack of tolerance and compassion in you, a lack of being able to accept people as they are. You should be able to love a person, accepting his or her imperfections, not having to close your eyes to them. In that way, you will really bestow a gift on your loved one who will then feel free of your expectations and not be forced or burdened in any way. Remember, my friends, when you do love, think about how you are doing it. Consider whether or not you are loving the wrong way. Now I wish to speak on another subject. The subject of decision-making is very important in everyone’s life, for everything is a decision. This is true not only of your deeds, your obvious and material choices, but also of every emotional attitude a decision holds. The majority of human beings are incapable of making clear-cut, mature decisions. That is why their souls become sick and suffering. Great disorder is created in the soul, which, of course, leads to confusion and conflicts. For you who are on this path, it might be very beneficial to start to view your life, particularly your conflicts, from this point of view. Have you made real decisions? Or do you sometimes make superficial decisions, not weighing or facing what is involved in them, and then thwarted when things naturally do not turn out to your satisfaction? Do you revolt against your self, your surroundings, and life in general? As long as you are living in this sphere of matter, every decision offers two and sometimes more alternatives. In some cases, there can be several wrong choices and one that is right. Only mature and responsible searching will eventually show you what the right way is. However, in many instances, it will not matter what you actually decide, provided the decision has been made wholeheartedly, awarely, responsibly, not shirking any issues or possible results. Even if one alternative would be better for you than the other, it is infinitely healthier for your soul, strange as this may appear at first, if you choose the wrong way but with the right attitude. Now what is the right and mature attitude with which to decide? The answer is simply to know what you want and to know what the price is; to realize that you cannot fully have what you want on this earth sphere because there is always a price or a disadvantage to any alternative; and to be wholly willing to pay the price even before it becomes a certainty that the possible disadvantage may turn out to be real. On the other hand, let us assume you chose the right alternative by accident. When I say by accident, I mean that you have chosen as most people do—immaturely, with half-closed eyes, not accepting beforehand the disadvantage implicit in your choice. In this way, you harm your soul a great deal more than by taking on a needlessly more difficult alternative. By deciding with the right attitude, you responsibly accept the price to be paid. So beware of making your decisions half-heartedly like a child, going into them with closed eyes, wishfully thinking that the price can be evaded. Each alternative will have an advantage and also a disadvantage, as long as you live in the world of matter. In high spiritual spheres and realms, the negative side does not exist anymore. In the lower spheres of darkness, however, no alternative carries with it a so-called advantage. For you, an advantage and a disadvantage will continue to exist until you have worked yourself up to those higher spheres where no disadvantage can befall you, even while still in the body, in the world of matter. To reach such a point you have to go through the laws governing this lower sphere that is rightfully yours for the moment: you have to accept the laws fully and keep them willingly, not because life forces you to do so. Then, and only then, will you reach that point. Trying to avoid the laws of your own world, no matter what spiritual acrobatics you may try, will not work. By the same token, a human being bound to the world of darkness will have to accept the conditions that govern that world, although still on this earth plane. This ties in with the first words of tonight’s lecture, my friends. To love God means naturally, among many other things, to abide by these various laws—and not only to abide by them, but also to accept them willingly. And one of these laws is that the disadvantageous side of each decision has to be faced and accepted. To make a mature decision means therefore to deliberate each alternative thoroughly; to face not only the advantageous sides of all alternatives in making your choice, but also and equally the disadvantageous. When you have done that, knowing that whatever you choose there is a price to be paid, you can ask yourself which price you prefer to pay; you can think it over, and see if perhaps you prefer to risk a higher price because the possible advantage seems worthwhile. You will then have accepted another one of this earth life’s rules, that the uncertainty also has to be accepted. This includes the risk, the shortcomings of life, which offers you no risk-proof plan. This, too, is important for emotional health, my friends. In that way you act as a mature being and your soul must benefit from it. No one who makes a decision in this way will ever come to grief because of it! Nor will they ever have to meet the conflicts that result from not making decisions in this way. Conflicts are created not because of a possible wrong or less advantageous decision, but because you go into the decision blindly, not ready and willing to pay the price. This, my friends, happens with each one of you. I do not see anyone who always makes emotional decisions maturely. I am again giving you strong material to work with on your path. 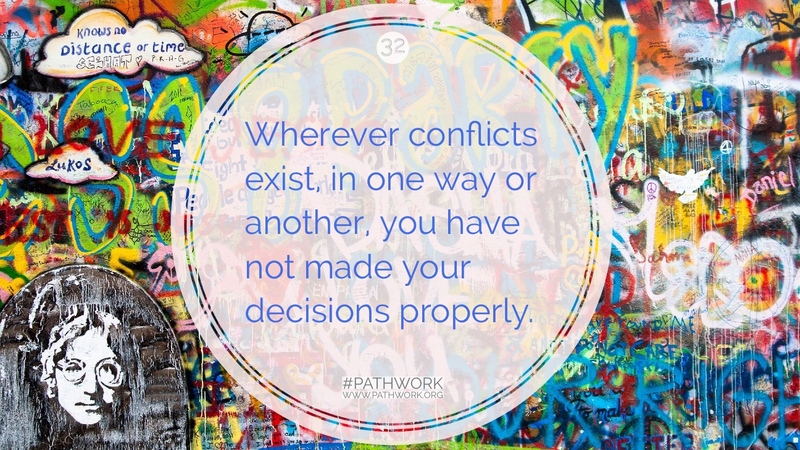 Wherever conflicts exist, in one way or another, you have not made your decisions properly. Do not remain on the surface level; you will have to dig deeper into your emotions in order to find the answer. Within your emotions, sooner or later you must find—provided you search honestly—that you have somehow not made a whole decision; you had somehow hoped to gain the advantage without accepting the disadvantage. And often you even hope—again without thinking it through clearly—to at the same time gain the advantage of both alternatives and to be spared the disadvantage of either. This amounts to cheating life, and the result must inevitably be that life will teach you a lesson and you will reap the disadvantages of both or all sides which you wished to avoid. If you test this emotional, and for the most part unconscious, current, what does this amount to? It amounts to greed. On this earth sphere most people are greedy, not necessarily in the material sense, but emotionally. And when I say greedy, I mean you want to amass advantages without shouldering the responsibility of paying the price for them. That, needless to say, is a violation of one spiritual law. Think about the words I have spoken tonight, my friends. This has not been a long lecture, but what I have said will add to the material you need for your progress, if you assimilate it properly and work with it in a very personal way. Thus we will have more time for your questions tonight, for which I am now ready. QUESTION: What about the ambivalence of overambition and lack of ambition in life? In other words, where does it come from, apart from laziness, if for instance there is no pronounced talent, or let us say, a glandular disturbance? ANSWER: A glandular disturbance is only an effect, as you know. Now let us discuss first a lack of ambition. As I promised you, I will analyze faults and lead you back to their original good quality. I will do it here with both extremes. I will then show you the harm the distortion does, what is connected with it, and what it means in the light of spiritual law. The good quality that was once the underlying factor of a lack of ambition was benevolence, harmony, a certain type of tolerance, of humility. This meant that such a person does not have to stand out and shine and be better or higher than others, for it does not add to peace if one strives too hard to triumph over others. Now I want it well understood that if you have the shortcoming of lack of ambition, this very fault can tempt to hold on to the positive side of this trait when hearing these words, and to forget the wrong extreme with its harmfulness. However, you should remember that your fault has a positive side or background, so to say. Build on that, so as to give you strength in your work to overcome this fault, so as to prevent you from feeling guilty. For no fault has been added on to you; all faults are but distortions or extreme manifestations of a once good quality. Furthermore, remember that it is possible to have a fault in one area of your personality, but in another you do not have it at all. Often you are only aware of the positive side of a particular trend, while you ignore its existence on the negative side. But the people around you often know. When they voice this, however, you feel unjustly accused, because for you only the unconscious, unaware positive side appears to exist. The human being is ambivalent; there are many contradictory currents in you. The harm of lack of ambition is a very grave one. Of course it is self-evident that it is neither desirable nor necessary to have ambition in all respects of life, for this would mean a waste of strength. But when ambitiousness is cultivated, it should be kept in mind that one must choose properly for what purpose one trains himself in this direction. It should be something that is worthwhile. The subject discussed in this lecture, concerning the proper decisions, will shed a light on this too. Ambition is often a price for what you desire. If you give in to your lack of ambition and then seem to be left wanting in one or more ways in life, you should realize you were not ready to pay a price that could perhaps only be paid by efforts that needed ambition. Spiritually, a lack of ambition is a very great hindrance. This sluggishness will prevent you from accomplishing your development which alone can bring you true happiness and security. If you lack happiness and you possess this trait, you should not bear a grudge because your needs were unfulfilled; instead, realize clearly what your decision has been in this case. On the one side, to give in to the immediate comforts is choosing the line of least resistance. The disadvantage here is that your conflicts, hungers, needs, and insecurities will persist as long as you do not fight the temptation of taking the line of least resistance, which shows lack of ambition. On the other side, the price is the hard work of overcoming a very deep-rooted laziness, which means constant fight, constant trying. The gain is that you come out of the webs of darkness, loneliness, unhappiness, but not until after you have shown ample proof that you have really and wholeheartedly fought and succeeded in some measure. Make your choice, for even making a negative choice is healthier than not seeing the issues clearly, hoping to relinquish only a tiny bit of your weakness, while expecting results that you would only be entitled to if you were to take yourself in hand completely. If you emotionally and unconsciously hope to attain spiritual development and thus peace of mind without making serious efforts to overcome this basic hindrance, you are actually attempting spiritual theft in some way. It means that you want to gain the harmony that can only be reached by paying the price, namely hard spiritual work. The necessary spiritual work here involves the overcoming of your greatest faults without exception. To understand lack of ambition from this point of view will, perhaps, make it easier for you to overcome it. You have not truly overcome this fault as long as you still have to force yourself to do the work. This means that your emotions still resist, that you are still not one with yourself. Simply recognize this fact and go on working if you have decided to do so. One day God’s grace and help will affect you so that what was once an effort will cease to be one. This will be a sign to you that your emotions have followed suit to your outer good will and that in this respect you have become one with yourself. Incidentally, I am not speaking personally to anyone in particular now. As in all my answers to questions, my words are addressed to many. So my friends, meditate upon this weakness from this angle: “If I have no ambition, if it is so difficult for me that whatever I do goes against the grain and I must force myself to do it; if I cannot do it with enthusiasm and real willpower; and if I still desire that which is rightfully mine if I were not to feel that way, my emotions want to steal something. I desire to steal happiness—or any other result.” Realize, please, that when I say that emotionally you want to steal something, I know that you do not want to do so consciously. That is always where the misunderstandings arise. I often speak of the desires of your emotions by translating them into concise language, for otherwise they could not be interpreted for your intellectual understanding. These emotions are often unconscious. And then, my friends, you take my translation of your emotions as an injustice because consciously, of course, you do not think that way. You overlook the fact that there is every so often a great chasm between what you consciously think and even truly desire, and what is in your unconscious, undermining that good and true desire by a contrary emotional current which you ignore. But, of course, you are not aware of that so far. It will be very important for you to become aware of it and that is why I occasionally point out this discrepancy. Be careful to understand that I do so to avoid completely unnecessary hurt feelings. In learning to become aware of these currents, you must first get to understand and interpret the symptoms which this unconscious current quite clearly sends forth all the time. Then you will see the symptoms all around you. So far, you have only chosen to overlook them. Returning to your question: Meditate upon this trend from the point of view shown you here. Realize that you must put effort into anything when you want to reap the fruits, which of course you do. You should not muster this effort because you are being told to do so, because you want to be a “good child,” still doing it against your will. You must reach the state when you do it independently, responsibly and maturely, because you realize yourself that everything has a price. To fight inwardly against this fact is not only disrespectful of God’s wisdom and justice, but also foolish. As far as the opposite extreme is concerned—overambitiousness—the original good quality is a strong willpower, a readiness to pay the price in effort, a desire to work, to serve in the higher realms for others. In lower realms the goal becomes the self. Use the positive aspects to cleanse this current of its exaggerated, distorted, and negative aspects which are: a certain type of selfishness; a power drive; self-righteousness; a certain greediness to have more, to be more. Often, overambitious people have such a strong desire current that they become ruthless in attaining their goal at the expense of others. Again I say, it is not necessary that your acts be that way, but it is sufficient that you are that way in your emotions. You should understand that overambitiousness creates an unhealthy desire current that runs in a wrong way and robs you of peace. Here desirelessness has to be achieved in a certain measure. Not completely, because then it would again become the opposite extreme of no ambition, and imbalance would result. The spiritual person in particular has to decide for what purpose and where to have ambition; on the other hand, the ambitiousness should cease when it is time for desirelessness to set in. QUESTION: I wanted to know what the fault is in a situation when you have feelings of rejection, culminating into feelings of resentment? ANSWER: In the first place your vanity is not being gratified. Because humility is lacking, the unconscious emotions claim that the personality must not be rejected; that rejection must not happen to it. In this way you want to be accepted by everyone or by the person you have chosen. You cannot bear that this desire of yours should not be granted. I want to emphasize again that I am not speaking personally since this feeling exists in so many people. In other words, there is self-will; your own will has to be gratified, or else you become resentful. In order to overcome these feelings, this current should be examined separately at first. Bring out the emotion that says, “My will be done.” Then, when this is conscious, the proper procedure would be to say to yourself, “But my will must not always be gratified. I have to accept standing back, if need be.” Try to be humble where you are lacking in humility. Do not try to learn humility where there are no shortcomings within you. This would give you a false reassurance and might make you overlook where exactly this concentration and work is most necessary. Then recognize the pride in combination with the self-will. Treat it similarly. If you can conquer both self-will and pride in this particular connection, your fear will be eliminated. For as long as you hold on to these currents, as long as you cannot give up what your little ego may desire—even if it is coated with higher motivations—you must be in constant fear that this desire will not be gratified. As soon as you have given up self-will and pride, your fear will vanish, and with it your resentment. By giving up, I do not necessarily mean a person with whom there is a real bond or a task to fulfill. I just mean to give up the desire current. Whenever there is resentment, it comes from a germ of hatred. Hatred may not manifest itself as such anymore, but as long as resentment exists, the root of hatred is still in the soul. It is not necessarily hatred against a particular person, but hatred nonetheless. QUESTION: In the last lecture you talked about the feeling of shame that manifests itself in guilt feelings, and so on. This often has an effect on others. What should our proper attitude be in a case like this toward such a person? ANSWER: It is already of tremendous help to realize that a person to whom you are close has that shortcoming. This realization will give you an understanding and a compassion that, even if you do not mention a word of it, must help. This realization will prevent you from being hurt unnecessarily, for people who are in any deviation of spiritual law and are therefore suffering often hurt others, because they think hurt is a means of protection. The other person hurts back and a vicious circle is set in motion. But when you do understand what you are doing this cannot happen. Furthermore, there is the undeniable fact that one’s unconscious affects the unconscious of the other person. In a case like this, unconscious shame and guilt is unconsciously absorbed by those around you. Because all this is going on unconsciously and is therefore not properly understood on the deeper emotional level, something sick and negative is felt and a very negative and unfavorable reaction comes forth, contrary to the desire of the person who has the shame and guilt feelings. There is nothing as contagious, my friends, as emotions, thoughts, and attitudes, conscious or unconscious. This, too, is a universal law. So, the moment a sick current is recognized by another person and fully understood, a vicious circle is already broken by the mere fact of understanding. The full understanding of the facts as explained here will help even more and inject the more constructive force of truth into the person’s psychological and emotional world. As for outer action, there the procedure varies. Caution is, of course, necessary. It is often better to say too little than too much to a person not mature enough to understand the nature of the soul or one who lacks the willingness to do so. But if the person is open and has the understanding to grasp these things, one may feel one’s way around how to reach her or him. If you pray for guidance and inspiration and keep yourself open, the right moment will come when there is receptivity. But if the receptivity is lacking and you come out with the truth too bluntly before the other person is prepared to face such truth, the effect will be negative and he or she will only close the door of the soul even more tightly. A safe way would be to first discuss the general subject, staying away from the personal, and to see how this is received. See whether the person becomes thoughtful and whether he or she has understanding for it in principle in the first place. If you see a somewhat favorable response, then slowly, little by little, you can give stronger doses of truth, always asking for inspiration and guidance. If you do that, your spirit friends will be around you and eager to help.